Even as babies are beginning to crawl, toddlers are learning to speak, and preschoolers are starting to cooperate with playmates, they can begin to discover God's Word and God's world through play. These 101 new games give young children the foundation they need in ways that are fun and exciting. 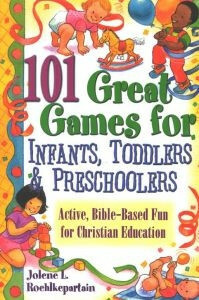 Fun Games for Infants, Toddlers & Preschoolers provides 101 Bible games for young children. You'll find 20 games designed for infants (up to 12 months old), 20 games for young toddlers (1 to 2 years old), 20 games for older toddlers (2 to 3 years old), 20 games for young preschoolers (3 to 4 years old), and 21 games for older preschoolers (4 to 5 years old). Each game includes a Scripture passage, a teaching point, a supervision tip, materials needed, and game instructions. Some games require little preparation and no materials. Others require more preparation. A number of games also include a bonus idea or a bonus tip for how to play the game in a different way. A Scripture index and a topical index provide information on locating games that tie into specific Scriptures and teaching points. Half of the games in this book feature Old Testament stories and teachings; the other half come from the New Testament.